"Let's Get Rid of the Weak Players Before We Even Start"
Day 1 twist: Both tribes have a "vote" which ends up selecting Sandy and Sierra to be voted "out"... and onto a helicopter that whisks them off to camp hours before their tribemates. Sierra works on building Timbira's shelter, while Sandy chooses instead to hunt for an idol. 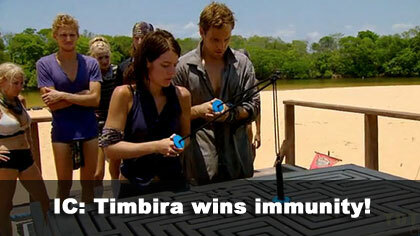 Ep1 Reward/Immunity challenge: "A River, Run Through It" - Timbira wins. Ep1 voted out: Carolina, over Sandy (7-1). - Jalapao: Sandy (5+: Joe, Taj, Spencer, Carolina, Stephen), and Stephen (1+: Sydney). Sandy & JT's votes unshown. - Timbira: Sierra (5+: Debbie, Coach, Erinn, Candace, Joe) and Erinn (1+: Brendan). Sierra & Tyson's votes unshown. - Carolina received 7 votes, from JT, Stephen, Taj, Joe, Sydney, Spencer, and Sandy (voted out, 7-1). - Sandy received 1 vote, from Carolina.